Apps that creates treemap presentation of how files consume hard drive space are nothing new. 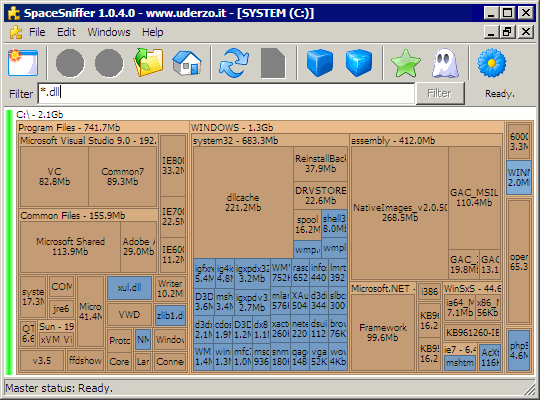 I had covered WinDirStat that came to be one of the more popular and functional freeware tools. It was all quiet until SpaceSniffer took niche by storm, appearing on most of major software blogs in span of one week. As usual I took some time to cool of and use it before review. Can only say it is quite worth the fame it got. SpaceSniffer only focuses on treemap view, without other representations. It was built for scratch with this in mind and lost some common interface decisions but gained some new as well. It has bit of eye-candy factor with customizable presentation and graphical effects like fading trail of hovers after mouse cursor. Was little annoying for my taste but later I stopped noticing. activity monitor – files changed on disk will flash in real time inside app. color-coding for file types is common feature and I miss it. Filter makes up for it in function but not ease of overview. SpaceSniffer is one of those apps that does powerful things but presents them in clean and easy to use interface. Freeware (with developer asking for donations), natively portable and highly recommended.